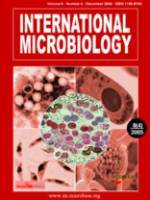 INTERNATIONAL MICROBIOLOGY is the new journal of the Spanish Society for Microbiology (SEM). It publishes original research papers, short communications, critical reviews and opinion letters dealing with all fields of microbiology and it addresses the international scientific community. The special fields covered are microorganisms (eukaryotes: protoctists, moulds, yeast; prokaryotes: bacteria, cyanobacteria, archaea; viruses, prions), microbial biology (physiology, ecology, morphology, taxonomy, genetics, pathogenesis) and microbial applications (environmental, soil, industrial, food, medical microbiology, biodeterioration, bioremediation, biotechnology). Papers related to microbial science on a worldwide basis are also considered. Special emphasis is given to issues that go beyond the traditional boundaries of a microbiology journal: the state-of-the art of microbiology in different parts of the world, the research activities and interests of outstanding microbiologists, the role of microbiology in society and education, new findings from the frontiers of current research, etc. Critical reviews of new books on microbial science are also welcome. INTERNATIONAL MICROBIOLOGY offers high-quality, internationally based information, short publication times and complete copy editing.